If you like a new or used vehicle shown on our site and would like to see how it handles, schedule a test drive below. One of our salespeople will contact you shortly to confirm the time and date. After your test drive, we'll give you $50 in gift cards! Price is plus tax, tag, title, registration, pre-delivery service fee of $995, and Private Tag Agency Fee of $184 not included in all vehicle prices shown and must be paid by the purchaser , Price includes all applicable Honda factory incentives. Price does not include any dealer installed accessories. The MSRP listed on the website includes Manufacturer destination fee of $895 for all Honda cars and $995 for CR-V, Odyssey, HR-V, Pilot and Ridgeline. All other price offers do not include manufacturer destination. Pricing not available with other offers or discounts. All vehicles subject to prior sale. See dealer for complete details. ***2-Years Free Maintenance package up to $300 value. ****Applicable for The 24 Club maintenance plan. 24 Months/24,000 Miles – Oil change/Tire Rotation/Multipoint Inspection Every 6,000 miles. 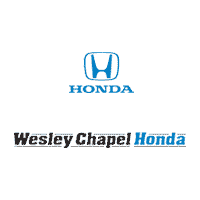 Wesley Chapel Honda	28.2356379, -82.356559.